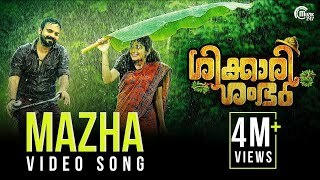 Mazha song Lyrics from Shikkari Shambu Malayalam movie. Lyrics of Mazha is drafted by Santhosh Varma. Mazha song is sung by Haricharan, Roshni Suresh. The film features Kunchacko Boban in lead roles. Lyrics to Mazha song,Mazha song translation in english. En Kathil Konchunna Then Mazha..
Oho Nin Kinakalil Njaan Mazha..
Nin Manam Thodaan Njaan Thira..
Sneham Karuthi Nenjil Theera Kadalai..
Oru Mazhavil Kodi Than Chaayam..